New Multimedia Drive Features Ethernet and Wireless Capability For Moving Content from the Home Network to the Home Theater. Iomega, an EMC company (NYSE: EMC) and a global leader in data protection, today added to its ScreenPlay™ series of Multimedia drives with the new Iomega® ScreenPlay™ Pro HD 1.0TB* Multimedia Drive. The new ScreenPlay Pro HD Multimedia Drive creates a convenient link between the home network and the home theater, giving users a convenient way to show off their family photos, play music, and enjoy their videos from the best seat in the house. New features in the ScreenPlay Pro HD Multimedia Drive include 10/100 Fast Ethernet for true network storage and more convenient access to files on the home network; wireless capability (USB WiFi dongle sold separately); new 1TB capacity (as well as a 500GB model in EMEA); better support for native high definition 720p and 1080i video; an Energy Star qualified adapter; a USB 2.0 connector for accessing additional storage from a portable hard drive or a USB Flash drive; as well as support for an even broader selection of formats for enjoying photos, music, and video selections. 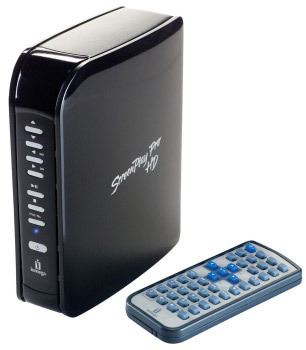 The Iomega ScreenPlay Pro HD Multimedia Drive comes with a remote control and holds up to 4 million photos, 18,500 hours of music, or 1500 hours of video**, enabling family and friends to share high-resolution photos, music, and video clips in the comfort of the living room, without a computer. A key feature for many users is a built-in basic video recording capability from a set-top box, letting users save a standard definition video clip for later viewing. The ScreenPlay Pro HD Multimedia Drive weighs just 2.16 pounds (0.98 kg) and measures 5.7″ by 3″ x 7.26″ (145 x 76 x 184 mm, L x W x H). Inside the ScreenPlay Pro HD Multimedia Drive is a 1.0TB 3.5 inch 7200 RPM hard drive formatted with the NTFS file system. PC connectivity options include 10/100 Fast Ethernet and USB 2.0. Video connection options include HDMI, component and composite video. Audio connection options include composite RCA and coaxial S/PDIF outputs. Contents include cables for USB, HDMI video, and composite video, along with a remote control. Using the HDMI or component outputs, the user can choose video settings from 480i/480p/720p/1080i. Supported media formats include MP3, AC3 (Dolby® Digital Encoding), DTS, PCM, AAC, WAV, WMA, MPEG-1, MPEG-2 (HL/ML), MPEG-4 (AVI/DiVX 3.11, 4.x, 5.x, 6.x/XViD), mov, iso, vob, mp4, mkv, JPEG, and BMP. The Iomega® ScreenPlay™ Pro HD Multimedia Drive is designed for use with the following PC operating systems: Microsoft® Windows® XP Home/XP Professional/XP Professional x64, Windows Vista™. The Iomega ® ScreenPlay™ Pro HD 1.0 TB Multimedia Drive USB 2.0/AV is now available in the Americas for $299.99 (Price is U.S. suggested retail.) In Europe, the 500GB model will retail for 199.00 EUR, and the 1TB model will retail for 249.00 EUR. Iomega Corporation, a wholly owned subsidiary of EMC Corporation headquartered in San Diego, is a worldwide leader in innovative storage and network security solutions for small and mid-sized businesses, consumers and others. The Company has sold more than 400 million digital storage drives and disks since its inception in 1980. Today, Iomega’s product portfolio includes industry leading network attached storage products, external hard drives, and our award-winning removable storage technology, the REV® Backup Drive. To learn about all of Iomega’s digital storage products and managed services solutions, please go to the Web at www.iomega.com. Resellers can visit Iomega at www.iomega.com/ipartner.